One of the first Guesscipes posted on this site was a Cheese stuffed turkey burger, and it’s still one of my favourites. I think there’s just something so exciting about foods with liquid cores. That’s why I’ve scaled it down for this recipe! 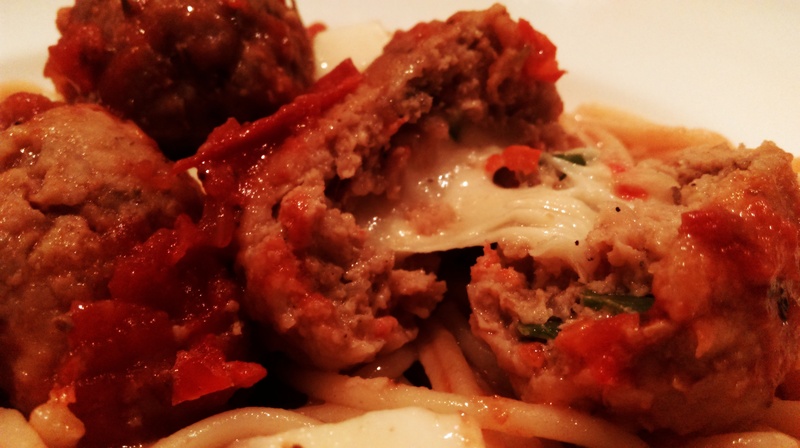 Now of course, you could swap out mozarella for any cheese, and likewise use any meat. 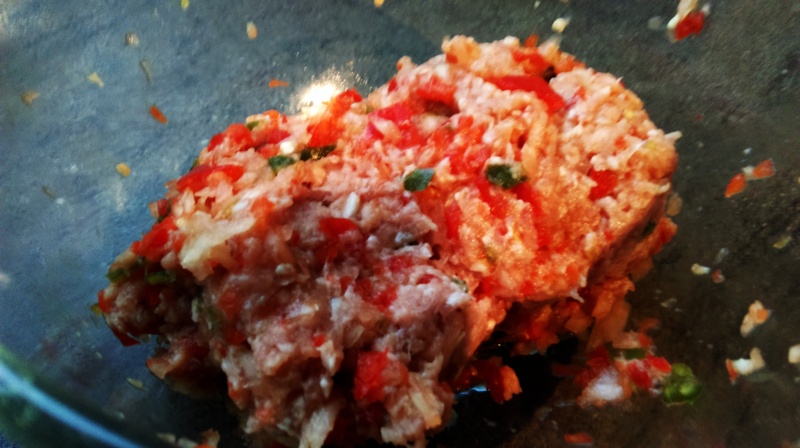 I went for pork and chose to make it spicy. I think another good one to try would be lamb mince with goats cheese and mint mixed into the meat. Onions, peppers etc. Basically just some vegetables to compliment but not overpower the taste. Think what works well with different meats and seasons. I like to include a garlic clove for a bit of kick. 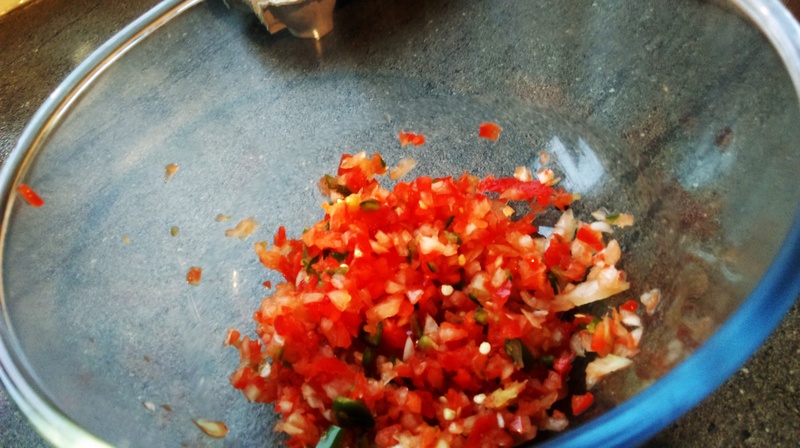 Using either a knife or a food processor, cut your filler (onions, peppers) down to tiny pieces and put in a bowl. Add the mince and use your hands to combine thoroughly. Add the breadcrumbs and one egg and combine further. 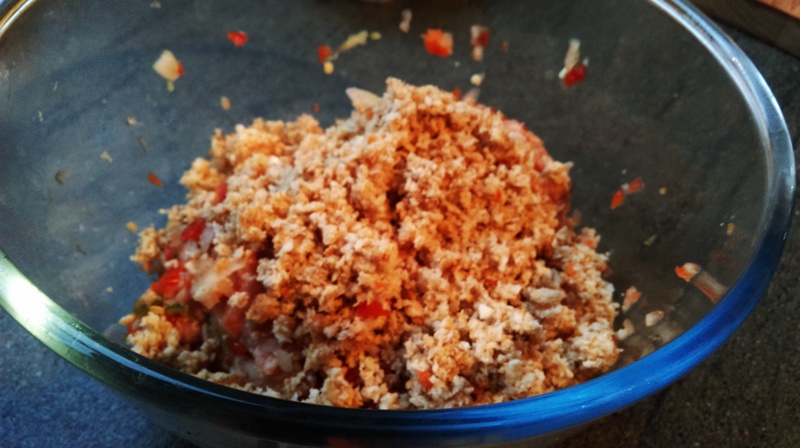 If the mixture seems too moist, just add more breadcrumbs. Slice the cheese into small chunks. 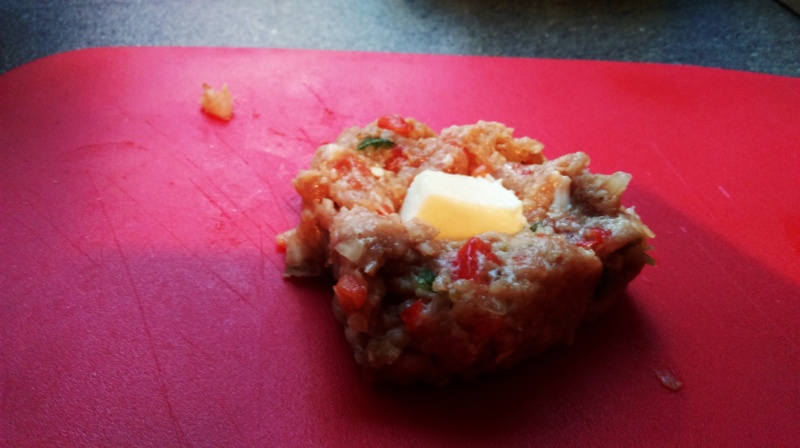 Using your hands, separate the mince into even portions as small discs on a chopping board. Gently press a piece of cheese into the center of each mince circle then use your hands to form the ball around it. Coat each ball in flour. 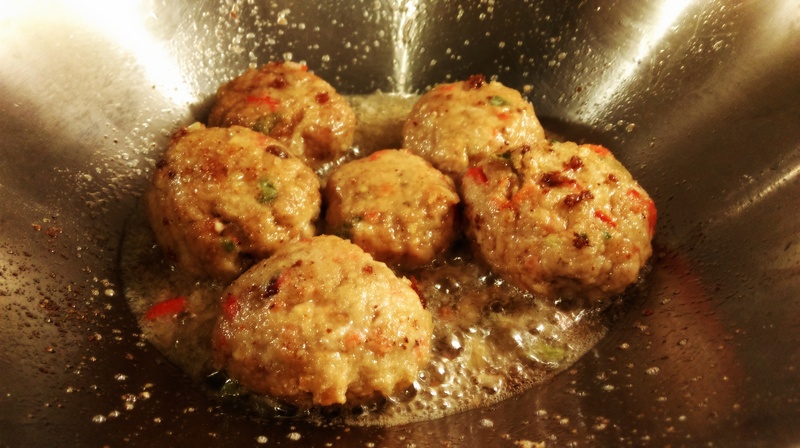 Heat some oil in a pan to a fairly high heat and begin cooking the meatballs, turning regularly so that they cook evenly. This may take longer than you expect, and be careful not to overcrowd the pan. 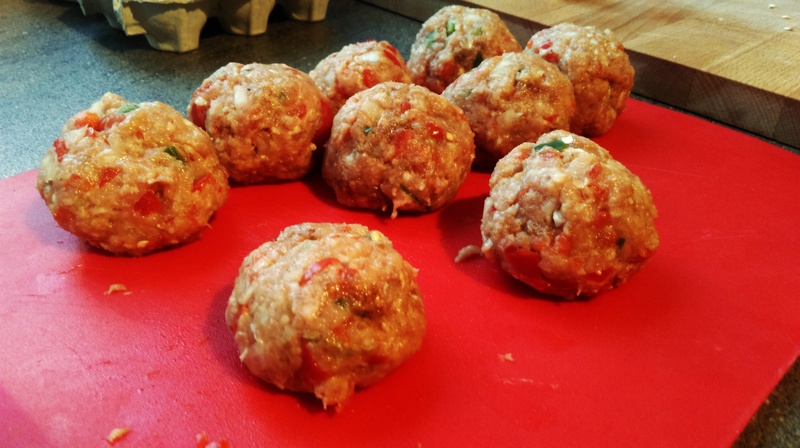 Test if they’re ready by cutting the largest meatball open and looking at the colour of the meat inside. Another good way to ensure these cook fully inside without burning is to cook them in tomato sauce AFTER frying for a little while. I like to serve these with classic Spaghetti in a Tomato Sauce, but they also work great as nibbles for a party. Keep refrigerated for no more than two days reheat for a long time at a gentle temperature if you want the cheese fully melted again. 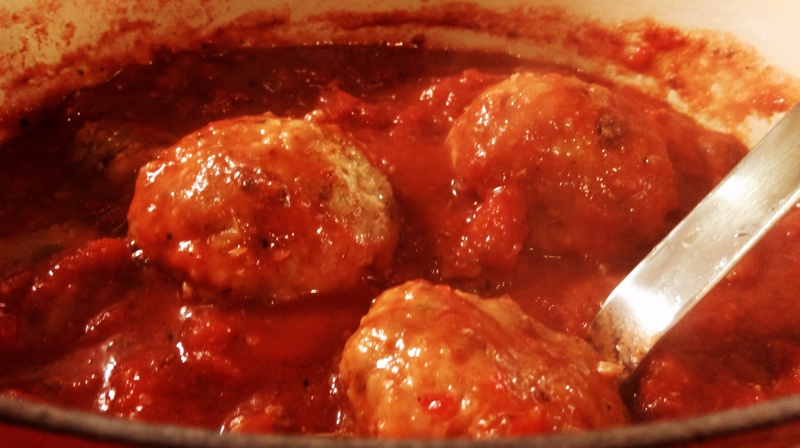 Posted in Beef, Guesscipes, Mains, Pork, Sides and SnacksTagged guesscipe, italian, meatballs, melt, mincemeat, mozarella, party food, pork, recipe, spaghettiBookmark the permalink.